Pneumatic Design First breath activation, balanced piston design, positive pressure lung demand valve. 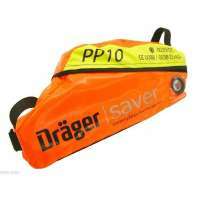 High Visibility Orange Carrying Bag with Photo Luminescent panels. Waterproof, fire resistant and washable. These days, most people in the safety and fire fighting industry have come to associate the name Draeger with the highest quality safety equipment. Robust, well made and based on the most technologically advanced components on the market today, these are what have built the reputation Drager enjoys today. Giving the user complete peace of mind, you can rely on the Drager Saver PP range of personal protection gear to supply you with clean breathable air on demand when you need it most. In any hazardous environment where breathing becomes endangered or difficult, there is a need for respiratory protection that will help to provide the wearer with an unhampered and fast escape. The PP range has evolved from years of customer consultation and rigorous testing resulting in apparatus that is highly advanced and reliable, guaranteeing the user the ultimate in safety and performance.